The double-edged sword that is Criterion. Overview: This is the story of two aging parents travelling to Tokyo for the first time, to visit their grown children. This recent viewing of Tokyo Story was my first screening of Yasujirô Ozu’s work. Within eight minutes I quickly grew apprehensive of what the next two hours would bring, as well as making me wonder how I’ll take An Autumn Afternoon and Floating Weeds, the other two Ozu films contained within the pages of the 1001 Movies You Must See Before You Die book that is – usually - my ever-enjoyable quest. An aging retried couple from the southern Japanese village of Onomichi are preparing to make their first trip to Tokyo. There, they look forward to spending time with their children and grandchildren. Their son Koichi (So Yamamura), is a pediatrician too busy to spend time with his own children, let alone his parents. Next is their daughter Shige (Haruko Sugimura), who seems more put out than pleased by the visit of her mother (Chieko Higashiyama) and father (Chishû Ryû). Finally there is Noriko (Setsuko Hara), the young daughter-in-law who lost her husband eight years ago during the war. Noriko, although not a blood relation, is pleased to entertain her in-laws, including taking them sightseeing and giving them spending money while they stay in Tokyo. It is a family drama that explores the dynamic between this family and their everyday lives while their parents are in town. Setsuko Hara, without a doubt, steals the show. Her smiling youth shines beautifully on the screen and her character’s personality and backstory gives her a dramatic advantage over the others. Unfortunately this isn’t saying much since the other characters are woefully bland. Setsuko’s Noriko is given the greatest opportunity to engage in the most profound of Tokyo Story’s conversations, whether it’s with her oft-neglected in-laws or her still unmarried sister-in-law Kyoko (Kyoko Kagawa). With the exception of one scene where the father, Shukichi, spends a drunken night out with old friends, the only scenes that make Tokyo Story tolerable are those that have Setsuko front and center. There are several unfortunate aspects of Tokyo Story. First is the irony of the title itself, given how little there is of ‘Tokyo’ and how little ‘Story’ there actually is. I enjoy a nice pastoral film on occasion. There’s something to be said about a meditative tale now and again. Human Drama is one of my favourite genres; they can do such a wonderful job of showcasing brilliant writing and acting. Tokyo Story is… not… one of those. As I watched, I wondered why the script was so dry, lines often tediously repetitive. A conversation in the first scene that focussed far too much on finding an air cushion made me fear for what was to come. Another missed opportunity was a scene where a drunken Shukichi stumbled to his eldest daughter Shige’s home late at night. What could have made for an intense dramatic scene was instead nothing more than a repetitive, infantile, high-pitched, one-sided, whiney tantrum from the middle-aged eldest daughter. It wasn’t ‘endearing’. It wasn’t ‘insightful’. It was shrill and annoying. She saves the film, regardless of how many times her father-in-law starts sentences with "Uhhm"
And through it all was the acting. I considered that perhaps Ozu decided to use a technique that would become common in the New Wave movement, namely using unskilled actors rather that professionals. It would explain how wooden everyone was in their acting, their cadence, their movement. Not so. The talent was, in fact, 'talented'. Were it not for Setsuko Hara, I may just have given up. Cinematographically, Tokyo Story offers no respite either. Ozu prides himself in his low, static shots. In fact, there is only one shot in which the camera actually moves. Naturally there are some interior shots that are brilliantly composed, but intentional as it may be, stasis leads to tedium. I can only take so much of a typical square interior of a typical Japanese house followed by another typical square interior of another typical Japanese house before exhaling a tired sigh. 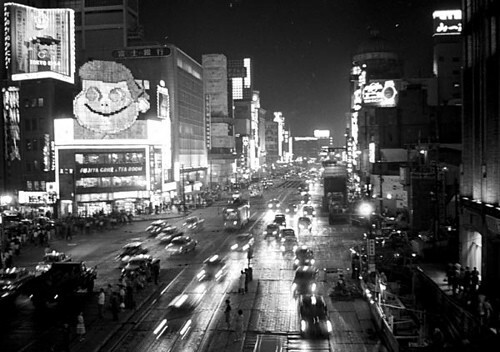 When the family finally went sightseeing, I was relieved to see what 1953's Tokyo cityscapes would bring. Sadly, that too was not to be. The scene showed us no sights besides a tour bus, and was cut short. It merely represented a day’s trip, only to bring us to another typical square interior of another typical Japanese house. This three-act story has its faults, and ones that will certainly not appeal to the general public. With so few scenes happening outside, it played out like a cheap two-set play. I saw a bevy of lost opportunities. Rather than getting into Tokyo Story, I found myself trapped in its claustrophobic confines. Rather than becoming immersed in Ozu’s characters, I was drowning in their clingy, cloying presence. Rather than finishing another little-known masterpiece from the 1001 Movies You Must See Before You Die book, I was disappointed at the drama and entertainment that I was denied. Incredible fan art of a tedious scene. In 1947, Akira Kurosawa’s inexpensive One Wonderful Sunday took us out into a bombed-out still-healing Tokyo. In 1949, his Stray Dog showed us a rather dramatic version of the forever-changed streets of a post-War Tokyo. In 1952, his brilliant Ikiru showed us Tokyo’s bureaucratic side as it worked its way free from occupation. Perhaps it’s outright unfair to compare any Japanese director to Japan’s greatest, but I expected much, much more from Yasujirô Ozu than I got - most notably Tokyo itself. 1001 Movies You Must See Before You Die | 1950-1959 | 50-62% | Drama | Foreign Drama Submitted by Squish on April 3, 2013 - 7:39pm. Submitted by Josh on April 12, 2013 - 5:53pm. There's also a reason why it ends up #5 on Sight and Sounds most recent top 1000 movies list. This is a film that somehow captures the mystery of life in a way that no other ever has. This movie captures sadness behind a smile and the "I love you with all my hearts" that can exist in a conversation about the weather. I've never seen a movie textured in quite this way and, since I recognize that the average viewer might not have the patience for it, I thought I would speak out on its behalf. Very few scenes have been as moving as the one in which Shikuchi sits alone at the end, this time without Tomi. Submitted by Squish on April 18, 2013 - 8:01am. Josh, you're right. This is indeed a beloved film and frequently defended, but personally I expect all of Ozu's films will, for me, be a chore. Submitted by Josh on April 20, 2013 - 11:52am. Late Spring, particularly, is like the shadow of Tokyo Story. Those same low static shots, the "everydayness" of Japanese life, and similar multi-layered performances which require multiple viewings to penetrate (with a lot of the same actors). I'm aware that most viewers simply will not be able to stand the pacing of these movies, but it's crucial for the "aftertaste" to occur. For me, weeks and weeks would pass and the movie would come back to me with something knew (really, both Late Spring and Tokyo Story had this effect). It had, in a way, settled in my soul as something containing a sad truth of life and loneliness and beauty. Submitted by Squish on April 21, 2013 - 8:29am. Submitted by Cameren on December 2, 2013 - 5:59pm. Indeed, wow. That was actually my experience with Ozu, and others too - especially the film Nostalghia, which is now among my most treasured.